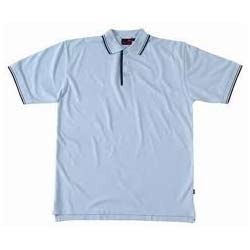 We are a leading Supplier, Manufacturer & Distributor of School Uniforms such as School Tunics, School Skirts, School Uniform Shirts, School Uniform T Shirts, School Uniform White T Shirts, School Blazers and many more items from India. 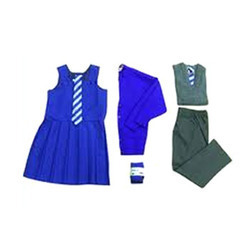 We are one of the most coveted manufacturers and suppliers of this high quality and finely stitched range of School Uniforms. Owing to our expertise in this domain, we have been able to designs these uniforms in a number of styles designs and shades. We make use of only high quality material in the making of our uniform range that is completely comfortable for the kids to wear. 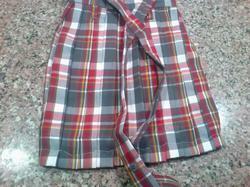 We stitch high quality SchoolSkirts for kids going to school. School authorities or suppliers can avail these skirts from us in standard designs and applied school patterns. Customers can easily avail this range from us at comprehensive price range. We have stringently made use of only approved and comforting fabric in the making of this range. In order to protect the school going kids from the chill of the winters, we bring forth this high quality range of School Sweaters And Pullovers. This sweater and pullover range can be availed from us at comprehensive wholesale prices. 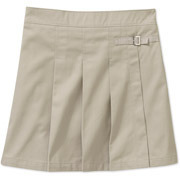 We take orders for bulk supplies of these uniform wears. Customers can stay unwary of quality as we have made use of only high quality material in the making of it. Pleated fancy skirts are available in different colours ie. black, white, khaki, navy blue in gaberdine and trovine fabric, with back elastic and with fix belt. 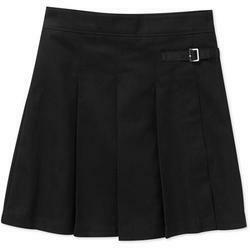 we are the manufacturer of high class school uniforms, at very reasonable rates. Customized Uniforms are also available. School Uniforms Socks as per customer requirement. For that perfect school outfit and a standard uniform look of the students, we bring forth this range of SchoolBlazers. 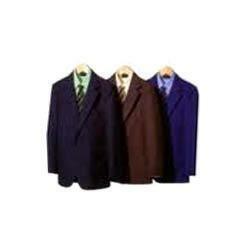 Customers can easily avail this blazers range at wholesale prices. This blazer has been stitched from the best quality thermal fabric that helps keep the chill away. Proper pockets as well as space for school symbol is given over the blazers along with matching standard buttons. 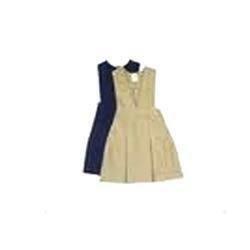 We have been able to provide the customers with a collection of School Tunics. These tunics have been designed as per the schools' uniform policy and have been made from the best suited fabric which is both skin friendly and light. Keeping the activities of the kids in mind, we have designed this tunic and have judicially chosen the cloth type. Our experts and highly coveted designers and stitching department has fabricated and made this School Uniform Shirts range to perfection. Made available to the customers in standards and variegated sizes, the offered range can be availed from us at the most comprehensive and market leading price range. 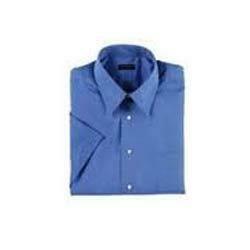 We can easily avail these shirts in bulk consignments. Owing to the sprawling infrastructure, we have been able to bring forth the clients an exclusive collection of School Uniform T Shirt. Customers involved in school management or school supplies can place orders for these t-shirts with us at the most comprehensive prices. We are able to fulfill bulk requirements in a stipulated time period. 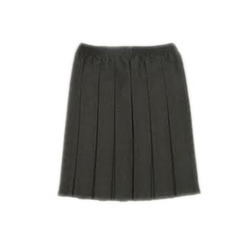 Pleated fancy skirts are available in different col ours ie. black, white, khaki, navy blue in gaberdine and trovine fabric, with back elastic and with fix belt. Pleated fancy skirts are available in different colors ie. black, white, khaki, navy blue in gaberdine and trovine fabric, with back elastic and with fix belt. School Uniform House T shirts available in 4 colours with coustomise printing. Sizes 24 to 42. 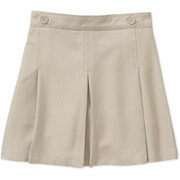 Looking for School Uniforms ?